If life is one great big circus then Fun Bingo is definitely part of the featured acrobatic act! Entertaining a roaring crowd since 2013 it is act you won’t want to miss. What is under the big tent surpasses any cotton candy, clown or Ferris wheel as it hits the bull eyes straight to the bingo lover’s weakness; bingo alternatives galore. The circus themed landing page shouts good times and sets the adrenaline rush in motion. There are two good reasons to consider Fun Bingo, the first being it is powered than none other than the Bingo software giant and it belongs to the Winners Bingo Network (WBN). Value is another key factor with bingo games at prices players can afford without stripping incredible Jackpot potential. Let the games begin with Instant Play Flash version accessibility requiring no download of software as you play straight from your browser. So you’re tired of online bingo sites that offer one or maybe two at best bingo game variants right? You’ll soon be revived because this dynamic platform has it all folks. That’s right if variety is the spice of life then Fun Bingo is sizzling hot with four alternative to choose from. The UK’s favorite 90 ball, US 75 ball, 80 ball and for those who like games fast and furious 30 ball Bingo. There a two Free rooms for 90 ball Bingo awarding cash prizes to winners with zero cost for tickets. Never miss your favorite game in the schedule by purchasing your cards in advance. The Slots section isn’t enormous we admit, but what is offered is definitely worth a spin or three. Video Slots and traditional Classic three reel Slots are available. If you are in the mood for a little Vegas style Casino action head over to the Blackjack or Roulette table. Video Poker and Scratch Cards are also available. The try before you buy policy is always a great way to experiment at not risk to your pocketbook. 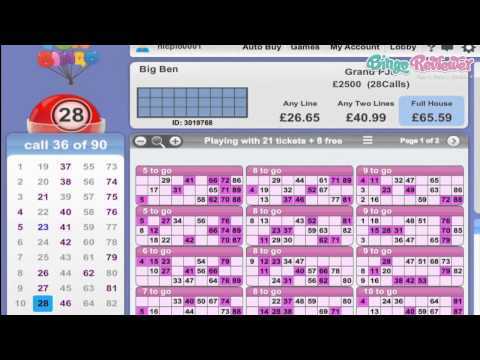 Fun Bingo understands that so they invite all new players who register an account to take advantage of the Free Bonus offer. Make your first deposit and receive a nice Bonus, make a second deposit and receive an even bigger bonus, make a third deposit and receive a fantastic bonus! Oh no need to fret because the Bonus treats don’t stop there with sweet offers on your fourth deposit onwards. Fancy the Slots? Get great special promotional offers on new releases including cash prizes for top spinners and Cash-back on your losses. Playing your favorite pastime should be fun and Fun Bingo is exactly what it provides for their customers with multiple variations of Bingo and full platform Slots and Casino products. A Mobile app is available for those on the go. Minimum withdrawal is £30. We rate Fun Bingo with 3 Pink Hearts. I kind of stumbled into this site, and as it happens, decided to give it a try because I really enjoy hitting new sites. I love the whole carnival theme, and with the £15 no deposit bonus, it would be really a shame not to give it a spin. Not to be confused, this is not only a Bingo site, and I was relieved to find Slots, specially because I love that combination. Even more because they have a 25% Cashback for slots (requires a £25 deposit and works on Thursdays and Saturdays). I was thrilled to find 12 Bingo rooms, and that's with 75 and 90 ball games which are fairly common, but also 80 and 30 ball games which I enjoy even more. If you want to get the most for your money, you should know that you get 2 free tickets for every 5 bought, and that's a deal I'll take anytime. Fun Bingo is definitely a blast and is actually one of my favorite sites to play at. I love the layout at the site. When you first logon, you just see a clear theme and a whole lot of color, which made me really want to get started playing. When I first joined, I received a decent welcome offer to start out my gaming experience with. I was given a very nice deposit bonus to be spread across my first three deposits to the site. One the first, the give you a 350% bonus, then 250% on the second and finally, a 300% bonus. They were also doing a special 20% cash back on slots play, which I believe they are still doing. I’m not sure if it was a limited-time offer or not. They have a very nice selection of bingo, slots and other casino games here as well as a lot of promotions that are well worth taking advantage of.